Other Immunogen Type corresponding to DDIT3. A bacterially expressed, mouse DDIT3 fusion protein. ab11419 has been shown to recognize an epitope in the N-terminal region of DDIT3. WB: HeLa cells treated with 2ug/ml tunicamycin for 4 hours. ICC/IF: HeLa (untreated and tunicamycin-treated). IHC-P: Human normal testis and pancreas adenocarcinoma tissues. Our Abpromise guarantee covers the use of ab11419 in the following tested applications. WB Use a concentration of 5 µg/ml. Detects a band of approximately 31 kDa (predicted molecular weight: 19 kDa). Please note that under normal cellular conditions this protein is not expressed in detectable levels, but is highly upregulated during times of cellular/ER stress. It is strongly recommended to run a positive control along your samples to confirm the expression levels of protein. Inhibits the DNA-binding activity of C/EBP and LAP by forming heterodimers that cannot bind DNA. Note=A chromosomal aberration involving DDIT3 is found in a patient with malignant myxoid liposarcoma. Translocation t(12;16)(q13;p11) with FUS. This blot was produced using a 4-12% Bis-tris gel under the MOPS buffer system. The gel was run at 200V for 55 minutes before being transferred onto a Nitrocellulose membrane at 30V for 70 minutes. The membrane was then blocked for an hour using 3% milk before ab11419 and ab181602 (Rabbit anti GAPDH) were incubated overnight at 4°C at a 5ug/ml concentration and 1/10000 dilution respectively. Antibody binding was detected using Goat anti-Rabbit IgG H&L (IRDye® 800CW) preadsorbed (ab216773) and Goat anti-Mouse IgG H&L (IRDye® 680RD) preadsorbed (ab216776) secondary antibodies at 1/20000 dilution for 1 hour at room temperature before imaging. IHC image of DDIT3 staining in a section of formalin-fixed paraffin-embedded human pancreas adenocarcinoma* performed on a Leica BONDTM system using the standard protocol F.
The section was pre-treated using heat mediated antigen retrieval with sodium citrate buffer (pH 6, epitope retrieval solution 1) for 20 mins. The section was then incubated with ab11419, 5 µg/ml, for 15 mins at room temperature and detected using an HRP conjugated compact polymer system. DAB was used as the chromogen. The section was then counterstained with hematoxylin and mounted with DPX. The inset secondary-only control image is taken from an identical assay without primary antibody. ab11419 staining DDIT3 in HeLa (Human epithelial cell line from cervix adenocarcinoma) cells +/- Tunicamycin (1.5μM, 6 hours). The cells were fixed with 4% PFA (10 min), permeabilized with 0.1% Triton-X for 5 mins and then blocked with 1% BSA/10% normal goat serum/0.3M glycine in 0.1%PBS-Tween for 1h. The cells were then incubated overnight at +4°C with ab11419 at 5μg/ml and ab6046, Rabbit polyclonal to beta Tubulin - Loading Control, at 1/1000 dilution. Cells were then incubated with ab150117, Goat Anti-Mouse IgG H&L (Alexa Fluor® 488) at 1/1000 dilution (shown in green) and ab150084, Goat polyclonal Secondary Antibody to Rabbit IgG - H&L (Alexa Fluor® 594) at 1/1000 dilution (shown in pseudocolor red). Nuclear DNA was labeled with DAPI (shown in blue). 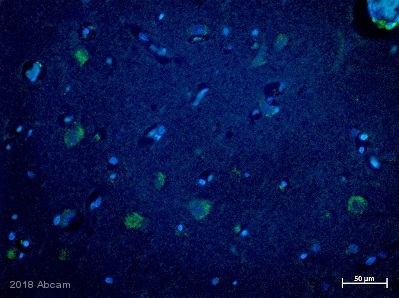 IHC image of DDIT3 staining in a section of formalin-fixed paraffin-embedded normal human testis* performed on a Leica BONDTM system using the standard protocol F.
Immunocytochemistry/ Immunofluorescence - Anti-DDIT3 antibody [9C8] (ab11419)Greenwood M et al. Transcription Factor CREB3L1 Regulates Endoplasmic Reticulum Stress Response Genes in the Osmotically Challenged Rat Hypothalamus. PLoS One 10:e0124956 (2015). Immunostaining of DDIT3 (green) and AVP (red) in the supraoptic nucleus of 3 days DH and 7 days SL rats shows expression of CHOP in the nuclei of AVP MCNs (magnocellular neurons). DDIT3 was stained using ab11419 at 1/200 dilution. The rat brains were removed and post-fixed overnight in 4% (w/v) PFA followed by 30% (w/v) sucrose prepared in PBS to cryoprotect the tissue prior to freezing over liquid nitrogen. Coronal sections (40 μm) of the forebrain were cut on a cryostat and washed in PBS three times. Sections then were blocked in 5% fetal bovine serum prepared in 0.25% (v/v) TritonX/PBS (PBST) for 30 min and then incubated with appropriate primary antibodies at 4°C for 48 hours. DH = Complete fluid deprivation. ab11419 staining DDIT3 in SKNSH cells treated with deltamethrin (ab141019), by ICC/IF. Increase of DDIT3 expression correlates with increased concentration of deltamethrin, as described in literature. The cells were incubated at 37°C for 48 hours in media containing different concentrations of ab141019 (deltamethrin) in DMSO, fixed with 100% methanol for 5 minutes at -20°C and blocked with PBS containing 10% goat serum, 0.3 M glycine, 1% BSA and 0.1% tween for 2h at room temperature. Staining of the treated cells with ab11419 (10 μg/ml) was performed overnight at 4°C in PBS containing 1% BSA and 0.1% tween. A DyLight® 488 anti-mouse polyclonal antibody (ab96879) at 1/250 dilution was used as the secondary antibody. Nuclei were counterstained with DAPI and are shown in blue. Thanks for the information, we tried the antibody several time, but still didn't work. Please refund us the cost. The original order# is **. Your credit note ID is ***.